Spent the day intermittently scooping away snow. The winds, however, were relentless and it wasn't until evening they dropped enough to try a walk about to gawk at what this bomb cyclone left behind. These drifts are nearly 20 feet tall and run about half a mile along the south side of a windbreak. So beautifully sculpted. It was a storm to remember! 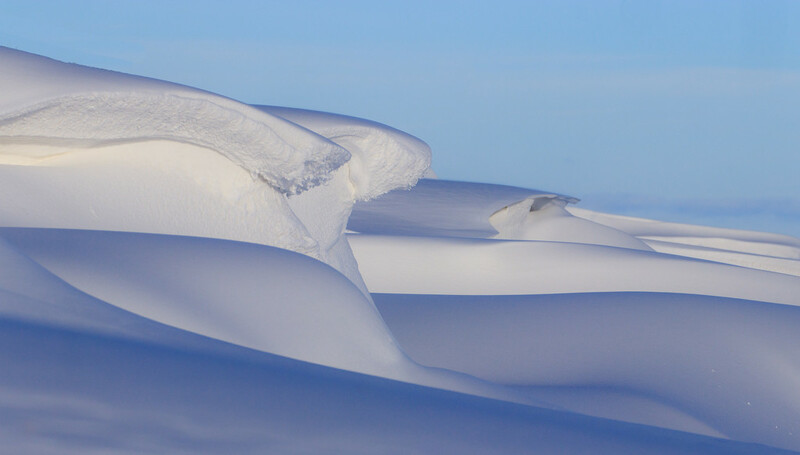 this is amazing, love the sculpted snow dunes. I've seen drifts like this after a snow storm when the drifts blew like this into the sunken Dorset lanes, which were 20 foot deep - the higher fields were less deep. I had gone home for the weekend and had to wait a week for the lanes to be dug out enough to get out. Makes for an incredible shot! Wow! What a storm. Oh my! Beautiful photo but the amount of snow must be unimaginable! A beautiful image but I should think the storm was quite daunting. Absolutely unreal - like you're in another world. (and I imagine you feel like you are!) Fabulous picture of the sculpting that the wind has created. I've been following the storm coverage of your area and it's unbelievable what you're experiencing. Do hope you're handling this ok.
Im sure the storm was not but this is lovely! I love the white and blue tones! Fabulous, lovely, and dreamy. Fav. Brilliant scene that makes for a wonderful abstract as well. Congrats on TT!